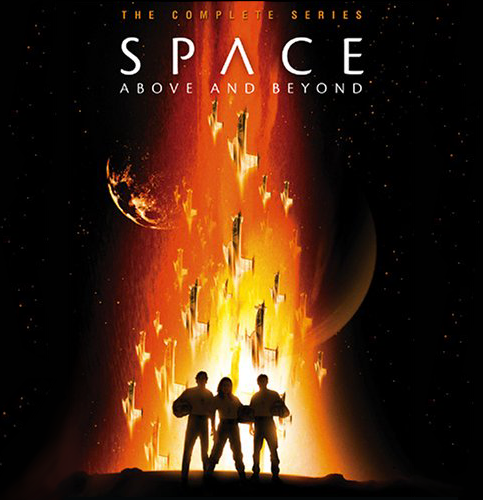 Recently, I took a dive through my DVD collection and pulled out the complete series of Space: Above and Beyond. The label “complete series” is a bit of a misnomer in that the show, like many of Fox’s SF series, only lasted for one season. But those twenty-four episodes managed to form a nicely cohesive narrative. In many ways the show can be seen as a spiritual step-father to the Battlestar Galactica reboot. In fact, if somebody handed me a list of all the themes that BSG explored during its four seasons, I wager that I could find examples of comparable quality in S:AAB. The show began in 1995 with X-Files executive producers Glen Morgan and James Wong. Relegated to a lousy post-Simpsons Sunday night time slot, S:AAB fought valiantly to gain a foothold in the sci-fi saturated mid 90s. Star Trek TNG had wrapped two years earlier, but DS9 was quickly finding its footing. Neophyte Voyager lurched through a first season with questionable writing and equally questionable acting. At the same time Babylon 5 had left behind its shaky freshman season and was diving headlong into the Earth civil war and Shadow War. Although each of these series featured humans from Earth in space ships, S:AAB was a different sort of show. Set in the year 2063, the series centered on the United States Marine Corps 58th fighter squadron, the Wildcards. The world of S:AAB was instantly familiar to its audience. Racial prejudices against the series’ race of artificially created humans could be used as allegory for any number of ethnic conflicts that came out of the immediate post-Cold War era. While the optimism of the Federation seemed utopian, the realism of S:AAB’s Earth united under the United Nations seemed almost plausible to a Western world that was still drunk from the after party of a forty year war of ideology. The beginning of the interspecies war between humanity and the enigmatic aliens dubbed “Chigs” struck an obvious chord with the Japanese attack on Pearl Harbour. From there the show dived headlong into the popular memory of the Second World War. Sometimes this was subtle. Other times it was not. I have no doubt that my esteemed colleague Dr. Dylan Cyr would have something to say about the episode that saw divisions of Marines, which included the 58th, marooned on a planet so that the allied fleet could pursue a target of greater opportunity. Yet this homage to Guadalcanal is done with such reverence and respect as to make the sacrifices of the Marines in WW2 absolutely heartbreaking, more so than anything The Pacific deigned to fling my way. Despite a cast of relative unknowns forming the core of the 58th squadron, veteran actors James Morrison, as the squadron’s no-nonsense commander, Lt. Colonel T.C. McQueen, and Tucker Smallwood, as Commodore Glenn Ross, skipper of the United States Navy Space Carrier Saratoga, anchored the show. I almost forgot to mention that USMC Gunnery Sergeant (ret.) R. Lee Ermey reprised a Gunney Hartman-esque role as the squadron’s drill instructor during the pilot episode, le mot juste. As the overall war effort continued numerous sub-plots emerged. Some, such as the saga of an alien ace dubbed Chiggy von Richtofen, happened in linear sequence. Others that involved corporate intrigue, fascism on the home front, and lead character Nathan West’s (Morgan Weisser) personal quest to find a loved one lost during the war’s outbreak play out sporadically through the season. And just like in a war, the show was heartless in how it treated the characters involved. Some were lucky enough to just die. Others were tortured, broken emotionally or maimed in battle. And a precious few even managed to find redemption amid the chaos of war. Though endless budgetary problems saw the 58th consigned to ground pound duty more than it saw them blasting Chigs from within their fighters, the series always made the best of things. At its conclusion the writers had wrapped up most of the major plot points. Where other cancelled series just stop, S:AAB actually offered an ending, tragic as it was. The special effects might look dated to a contemporary audience, but the stories that the series told are as poignant as ever. My recommendation is to watch an episode a day over a month so that you might be reminded of what televised SF has the potential to be. Here’s a clip from the X-Mas episode, you know, because it’s December and all that.